Mr. Lee currently serves as Business Manager and Director of Technology at Mt. Enterprise ISD. Mr. Lee began his career as a mathematics teacher in 1993 at Mt. Enterprise ISD and has taught everything from seventh grade math to AP Calculus. 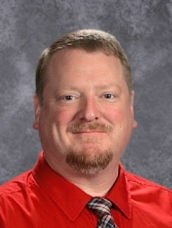 In 1999, he added the role of technology director while still teaching and transitioned into full time technology work in 2007. In 2008, he added the role of district testing coordinator, co-principal in 2012, became Elementary Principal in 2013, and moved to Business Manager in 2018. He received his Bachelor's degree from the University of Texas at Tyler, his Master's in Educational Administration from Lamar University, and his Superintendent Certification from the University of Texas at Tyler. Mr. Lee is married to Mrs. Michelle Lee, who is the librarian and testing coordinator at MEISD. He has two sons - Travis, a 2016 MHS graduate and Jake, who will be a junior in 18-19. The Lee family also has a spoiled rotten cat, Bella. In his spare time, Mr. Lee enjoys singing and playing bass guitar in an old time rock and roll band, working on his antique car, and building plastic models. Mr. Lee can be reached via email at alee@meisd.org. Don't forget to visit our district Facebook page at www.facebook.com/MountEnterpriseIsd. As always, if you have any questions or concerns, please contact me at alee@meisd.org or 903.822.3721.